A few months ago, I tested some handmade beer glasses from the Pretentious Glass Co. in order to examine how different craft beer styles work in conjunction with craft glassware. These glasses were smooth, durable and uniquely constructed. I was impressed with their design and general function. They had a feel to them quite unlike any other glasses that I’ve used; as if they were an investment, something that you could use for life. You can click here to read all about them. That said, today I want to talk about glassware again, but from a slightly different angle. Alambika is a boutique located in the Outremont region of urban Montreal. I’ve frequented the store a few times in order to buy some glassware. In doing so I got to know owner and glassware aficionado, Jean-Sébastien Michel. 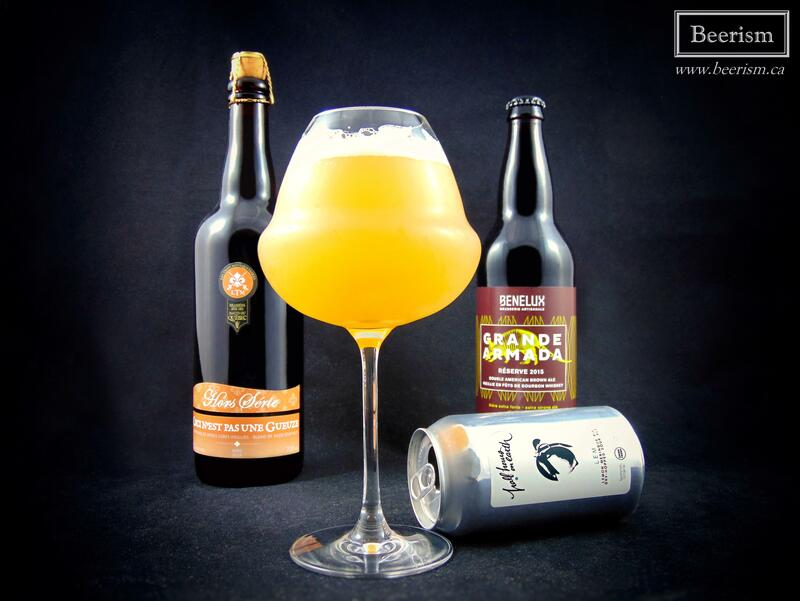 For this second glassware article, I wanted to examine some finer, more delicate crystal glassware, and really dive into their ability to showcase beer in a slightly different light. After chatting with J.S. about my options, he highly recommended these new Lehmann Oenomust (unleaded) crystal glasses. As you can see from the photos, these glasses have a long delicate stem, leading up towards a large rounded base that angles inward aggressively. He was kind enough to ship me three different sizes to test, and I chose particular beers to match each glass. I got with Jean-Sébastien in order to ask some questions about these samples and about glassware in general. From someone who owns an establishment that is dedicated to the drinking experience, can you tell us why good glassware important? Glassware is key to enjoyment on so many levels. First, the anticipation. A three Michelin stars meal served in a brown take-out box with a plastic spoon definitely changes your relationship with the food, even though what you’re eating remains exactly the same. Glassware and booze are no different. A thick, yellowish glass with a logo of some random brand on it pretty much kills the mood before the first sip. Even at the subconscious level, it takes away from the enjoyment to come. Then when you start sipping, the balance of a glass in your hand – whether it’s because it is too top-heavy or not fun to handle – also challenges your appreciation. There are more subjective elements as well; some will like a heavy pint because it fills the hand, has a blue collar vibe to it and has an implicit meaning that the real show is what’s inside the glass. On the other hand, a stemmed glass brings an idea of sophistication and higher level of thought in the vessel. Stems prevent you from warming the beer, smothering ribs sauce on the glass, and getting your hands wet from condensation. After that there is the shape of the bowl and the sheer size. Big and thick glasses – unless cooled beforehand – will be more likely to result in lukewarm beer toward the end. Shape will play a major role in bringing out the aroma, which is a key feature of craft beer. It can either reveal or mask it. Do you think wine glassware can generally be used for certain beer styles, or should beer-dedicated glasses be our first choice? 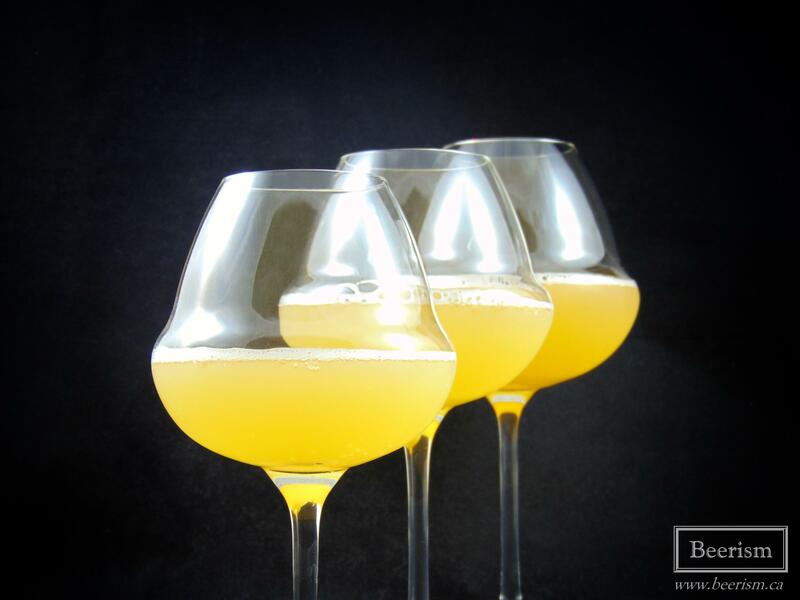 The glassware industry started to make glasses for wine with efficiency in mind around the middle of the 20th century, and those shapes have not been mainstream since before the 1980s and 1990s. Before that, glass shapes were mostly dictated by aesthetics and cultural elements (different regions had different shapes, patterns or colours, etc.). They could be interesting to see on a table or shelf, but sucked real bad when in use, where they masked aromas. Beer only had this revolution very recently, most notably with the famous Spiegelau IPA Dogfish glass. Since the logic of enhancing the beverage is basically the same for beer and wine – creating a larger base so that aromas can develop and a narrower top so they concentrate – looking at wine glasses to serve beer unlocks HUGE potential for those who want to get the most out of there beers. Snubbing wine glasses because they are considered too snobby or inappropriate is just missing out on what they have to offer. Considering the number of glasses that you have sampled and tested, why are these Lehmann Oenomust glasses so special? What do they provide the drinker that others might not? I see nothing wrong with collecting beer glasses with labels on them – like the ones traditionally issued as marketing devices by breweries. However, for a long time, those glasses were – for the above mentioned reasons – mostly show pieces, and more often than not, printed on poorly made soda lime glasses. Although I had many beer glasses myself (I collected them from 16 to 25 years old) I always ended up drinking from the same beer tulips. That was the best shape to me: a short stem allowing the beer to stay away from my hand’s heat and while also enhancing the aroma. From time to time I liked to use Champagne glasses designed for tasting (wider than flutes) or wine glasses I had at home. Now, I pretty much only use Tekus and my trusted Oenomusts. The Oenomust glasses are freaking holy grails of aroma enhancing. They come in different sizes, are sturdy, not too expensive, and the top is narrow, yet not TOO narrow. You know, some nosing glasses almost expect you to only smell, because they are a nightmare to drink due to their very small opening. Not the case here. 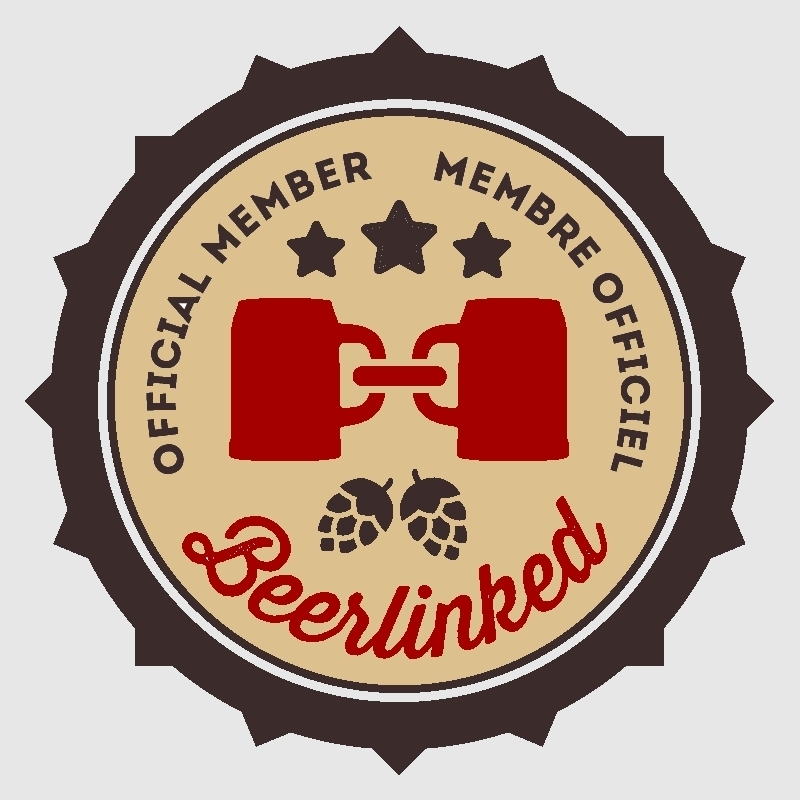 Basically, with the Oenomust, I have a one-shape-fits-all weapon for most of my beer sampling. They also come as great tools for beer or wine makers as you can really pinpoint aromas that you would otherwise not be sure about. It is quite fascinating to see a brewer re-discover his or her own beer in front of you while using them! Their round base makes it easy for swirling without spilling. I especially like the 350ml small-stature version to carry around during wine and beer festivals. I cannot tell you how many times I get asked questions when I bring them with me, haha! The rest of the time, I use the 420ml. They have that “UFO” look that can be startling at first, but it definitely grows on you. They even made a pitch-black edition for blind tastings. You know, Lehmann is a young company started by Gérard Basset, a really nice, no frills sommelier who has won Meilleur Sommelier du Monde 2010 – the most prestigious wine professional contest there is. He created these glasses and was the first to acknowledge that they are great for beers! I will not argue with him on that! Lehmann will be at La Grande Dégustation de Montréal this year, come ask them questions in person if you want to know more. They are otherwise available by the stem at Alambika. Well then, I really need to dive into these glasses now! Half Hours on Earth is this amazing little brewery out of Seaforth Ontario. They specialize in modern farmhouse ales, with a focus on all things tart and delicious. HHOE experiments with lots of adjuncts, but always uses them in a balanced and intriguing way – never letting the ingredient overpower the beer. 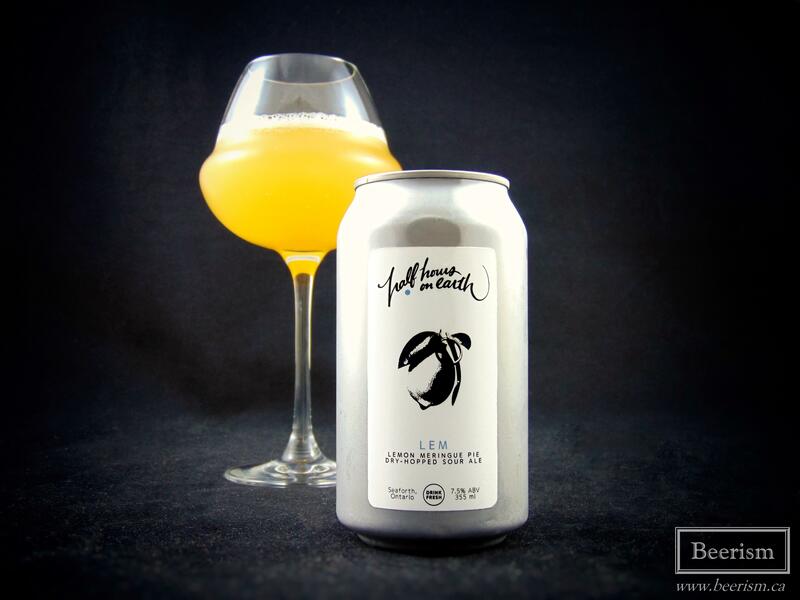 So when I saw LEM get released – a Lemon Meringue Pie Dry-Hopped Sour – I knew I needed to try it. The nose carries a huge blast of lemon zest, followed by light biscuit, vanilla and lots of acidic aromatics. The citrus is certainly in your face, with layers of lemon, zesty hops and loads of lactic bite. It’s very inviting. On the palate, it’s a bit more balanced than expected. The sourness is restrained, and instead it’s quite tart and rounded against the other flavours. Bright lemon zest hits you off the bat, followed by subtle vanilla and some cakey/biscuity graham cracker sweetness. Don’t get me wrong though, this is dry and not actually sugary in the least. Everything is in balance. The hops provide another layer of zestiness, carrying some juicy tropical fruits, but still mostly lemon-focused in its fruit profile. The glass really assists in directing the intensely aromatic citrus profile into my nose, especially when taking a sip, which helps fully actualize the entire lemon meringue pie experience. If you are not familiar with Half Hours on Earth, you can read my previous article where I interviewed their owner and brewer. 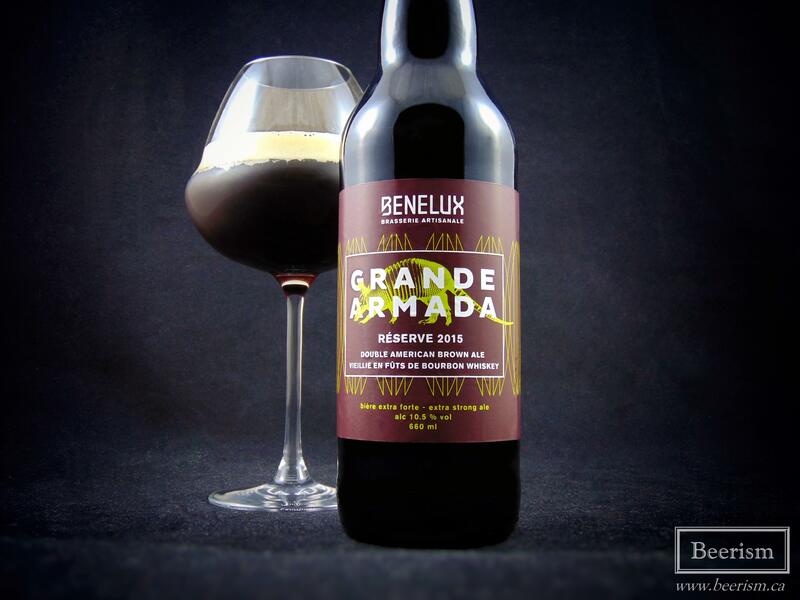 This bottle of Grande Armada (2015) from Benelux has been sitting in my cellar for a few months now. Réserve 2015 is the fourth iteration of this bourbon barrel-aged double American brown ale. For the largest of the Oenomust glasses, I wanted to showcase a big and bold beer, with rich and robust aromatics. Grande Armada seemed like the right choice. The nose wafts huge barrel aromatics, carrying vanilla, oak, and loads of bourbon. Dates and raisins come through as well, with some rich rum cake and maple. On the palate, there is a nice sweetness, carrying brown sugar and dates at the front. This is met by a big bourbon presence, which lends vanilla and some light oak tannins to the mix. The finish is a bit viscous, but the rich booziness cuts through the sugars, drying things out nicely. I’m drinking this beer in the heat, but every sniff I take reminds me of Christmas. It has a plum pudding element that makes me warm inside. The glass concentrates the nose incredibly, allowing my senses to take in every subtle nuance with amazing precision. While the thin glass wall assists in cutting through the rich body, it also allows it to shine. For those unfamiliar with “Ceci n’est pas une Gueuze” from Les Trois Mousquetaires, let me give you a brief explanation. 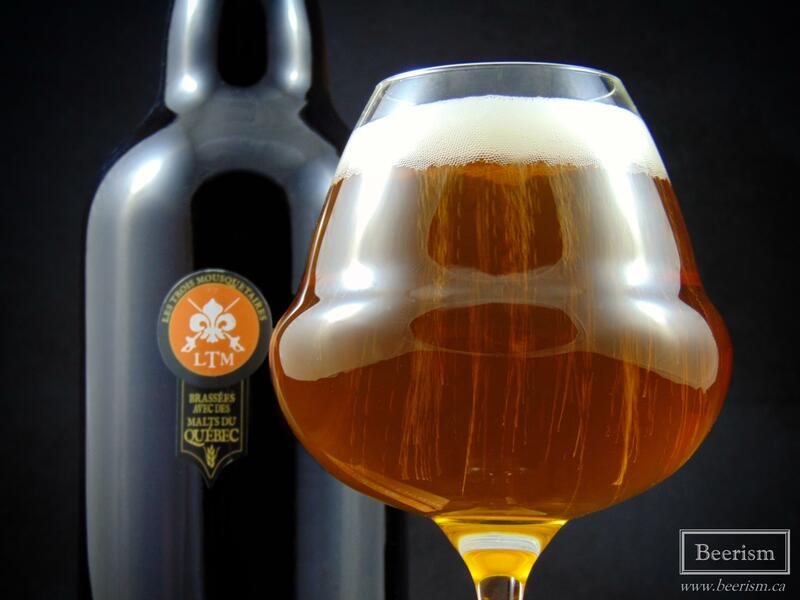 This is the third vintage of this beer, and although it is not an authentic Lambic Gueuze, it does mimic some of the processes taken to create one. I’ve talked about this beer at length before, so if you are interested, you can read about it right here. For the smallest example of the Lehmann Oenomust glasses, I thought this sour and complex beer would fit well. It is drinkable and delicate, while still being quite round and robust. CNPUG 2017 pours out a clear copper orange colour, carrying a nice frothy head that doesn’t dissipate. The nose begins with lots of dusty brett funk alongside rich vinous soaked oak. There are notes of apple, grapefruit and light bready malts. Some white balsamic starts coming through as well, adding more layers to this already complex nose. On the palate the acidity hits first, blasting my senses with a big hit of sour pleasure. Lactic acid combines with an acetic bite to provide a layered tart complexity. Lots of under-ripe apples, grapefruit pith and tangy ground cherries make up the fruit profile. This is followed by earthy and dry phenols. The finish is long, carrying lingering balsamic notes and rich tannins. Again, the glass really helps shape the aromatics, concentrating them upon each sip. Although the acetic notes add layers to the flavour profile, I’d still prefer that they weren’t there. This beer is both aggressive and delicate, with nuanced aromas that this glass really helps define. As it opens, the gueuze-like profile becomes more apparent, carrying a rich microflora profile. As well, that quintessential grapefruit rind thing comes through, with a big oakey layer, throwing dusty basement at my palate. At this point I’ve had a chance to try several styles of beer in these Lehmann Oenomust glasses. It’s always a pleasure. The lightweight and delicate nature of the glassware makes for a sleek, refined drinking experience, while they are still strong enough to hold an ample amount of beer without feeling like they will implode at any given moment. The design of the bulb is brilliant, concentrating the aromatics more intensely than any other glass I’ve used, which in and of itself, changes the drinking experience for the better. These glasses are best used with highly aromatic examples, so crushable beers like pilsners or pale ales might be better served in your classic shaker. That said, imperial stouts, sours, saisons, IPA’s, etc. will all work extremely well. I’d certainly recommend grabbing these glasses if you have the chance, you can order them online right here or go to Alambika if you are in Montreal.